Saudi Aramco team with JEC project team. State oil giant Saudi Aramco said construction is now in full swing at the Jazan Economic City (JEC) and also work is going at a steady pace at its refinery complex which is now about 70 per cent complete. The massive projects coming up at Jazan in the southwest of Saudi Arabia, will transform the region and further boost Saudi Aramco’s already proven track record in delivering mega-projects designed to fuel a diversified economy for the Kingdom’s future and provide a solid platform for its Saudi Vision 2030 economic road map. The 106 sq km JEC is seen as pivotal to the economic development of the Jazan region and as a key future driver for foreign direct investment into the Kingdom, said a statement from Aramco. The Jazan refinery complex will be equipped with a state-of-the-art port and a 4GW power plant that will make the refinery entirely self-sufficient and provide power to locally owned manufacturing and service companies, it stated. 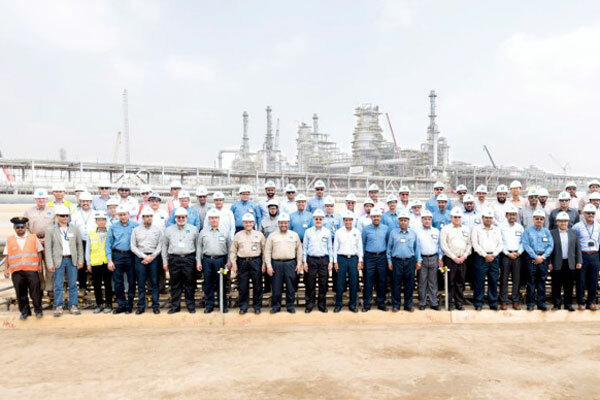 Members of Saudi Aramco’s management team, led by president and CEO Amin Nasser, visited the JEC last week to review the work at its refinery and terminal projects. Saudi Aramco management also toured the under-construction port, where massive dredgers could be seen at work. The site consists of a wide range of complex engineering and construction packages that will integrate to reach a processing capacity of more than 400,000 barrels per day (bpd) of crude oil, providing fuels for domestic and international customers. During the tour, the group stopped to meet young trainees from the Jazan Contractors Alliance for Training and Employment at Maharat. Over the next four years of the refinery project’s construction phase, Maharat is expected to train and place roughly 5,000 Saudis for construction-related jobs, said the company statement. The almost fully constructed 4.9 kilometer corniche for the new JEC was the final part of the visit, it added. At the Jazan Project Management Office, Nasser and his team was given an update on the overall project progress in terms of construction and operations. Nasser, lauding the project management team for the dedicated work, said: "This project is very important for the region and we should be proud of the positive impact we are creating in terms of enabling an ecosystem."